West Central African montane forest destinations are more famous as biodiversity hotspots or centres for western scientific expeditions (with undetected ecotourism). This paper is part of a pioneering initiative to profile ecotourism as it develops in Muanenguba, a mountain area in the south west of Cameroon. It is the outcome of a fieldwork process which can best be described as ‘being native’ by cooperating with frontline host actors to track visitors and capture ecotourism practices. The study discovers that the visitors – predominantly highly educated professionals, travel groups made of friends and families – are eco-friendly due to their backgrounds and respect for the scenic splendours of the destination. They also embrace both modern convenience and local tradition because the hosts, Bakossi villagers and other accommodation providers have, without realising it, taken a key aspect of their culture - the traditional house - Ndab Echum - to the visitors. Other interesting findings comprise the relevance of visitor opinions and proven action in identifying ecotourists, visitor interest in both dominant trip activities and ethical initiatives as well as less common travel motivations such as ‘ambiance’. Based on language and development potential, a TV documentary assessed Cameroon as ‘a global player at the periphery of mainstream society’. Despite its label as an ecotourism paradise by some visitors, Cameroon received just 451,000 tourists in 2006, still short of the objective of 500000 to qualify as a developed tourism destination by WTO standards (Okole, 2008). Cameroon represents Africa in miniature. From the forested, coastal south and southeast to the sahelian north, Cameroon presents every visitor with diversity in natural (forests, mountains, lakes, tropical rivers, climates) and cultural attractions (folklore, enduring kingdoms, elaborate festivals, tales) created by over 200 ethnic groups. There are also hotels of international standard, golf courses, colonial relics and a diversity of ecological and wildlife sanctuaries. These resources offer various opportunities for different types of tourism. Regarding the current situation, Behrens (2005) expresses confidence that the wide range of natural and cultural attractions illustrates Cameroon’s ecotourism potential. However, state incapacity, centralization and lack of an effective national strategy for tourism constitute retarding issues. Muanenguba (4° 40’ to 5° 15’ N and 9° 36’ to 9° 70’ E) is a stratovolcano straddling the South West and Littoral Provinces of Cameroon (part of the West Cameroon Mountain Line). It occupies the northern part of the tribal Bakossiland and covers an area of about 25 square km. 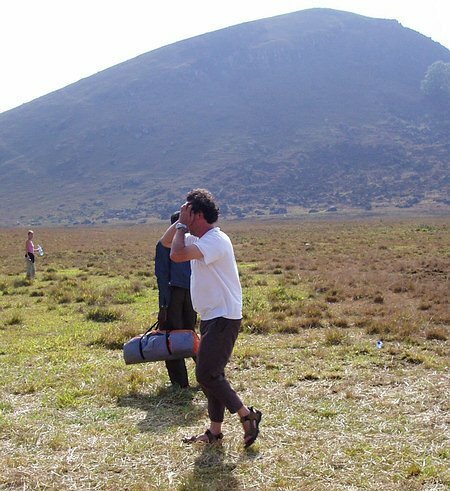 The current destination/summit area of Muanenguba, traditionally called Mwaam (1950-2411m above sea level) – composed of the picturesque/concentric Ebwo Caldera and Twin Lakes, the principal attractions, is the product of polygenic vulcanicity which occurred between 156-56 million years ago (Dongmo et al., 2003). Mwaam is rich in traditional history, awe-inspiring geology and scenic splendours. Its romantic setting, the open, airy, tranquil, naturally clean caldera floor, the beckoning character of the Ebwo and Alehngum Peaks, and the ‘glorious views’ , as described by a visitor, of the famous Twin Lakes, which show an amazing contrast in colour (female-green and blue-male), all adorned by the picturesque enclosure of the rim of the caldera, add to the sense of an extraordinarily elegant destination, a welcome escape to peace and quiet. Mwaam is a destination that distinguishes a genuine nature-based tourist motivated by the need for a ‘contrast to everyday life’ (Mehemettoglu, 2007:111). Lucky visitors to Mwaam are welcomed by the sight of moving schools of fish (at 200m) as soon as they stand by the concrete rest huts (buckaroos) and look down the steep-sided crater of the Female lake. Some visitors venture down to the female lake, explore the accessible northern shores and enjoy a thrilling swim through the transparent and shallow waters where crowns of aquatic plants (fish habitats) peep through the lake floor. Although the social set-up of the Bakossiland has been historically affected by globalization (initially through Colonialism & Christianity), modernization and insitu traditional changes, the peasant/village communities, Bakossi peoples-the custodians, limited to fleeting contact with the visitors, are still rooted through reliance on ‘their holders of mbwog’, traditional bastions such as clan sanctuaries and sacred societies. In respect of the ethereality of Mwaam, local people consider Mwaam to be their cradle: their ‘ancestors living in the Lakes’. They have reintroduced two purpose-built traditional lodges (Ndab Echum) on the northern accessible shores of the female lake in order to ‘symbolize [their] custodianship of Mwaam’. This essentially and effectively has transformed into a process of attaching tradition to nature – taking a product or taking ‘culture to the visitor’. Visitors appreciate this indigenous initiative. Tourism in Mwaam is managed by the Bangem Rural Council (BRC). This research note follows six months of field work (January to June 2007) during the dry or tourism season which lasts November to May. In a process best referred to as being "sensibly native", the investigator manipulated his "son-of-the soil" status. In this regard, he cooperated with main actors (hoteliers and national security officials) in order to track visitors. This was through access point registration and in participation access point-generated guide research trips. By so doing, visitors were guided during destination tours, interviewed, and ethically monitored. In effect, the visitor referred to by indigenes as nkale, became the locally-preferred nkinmut (the interactive/accompanied stranger). Tourism occurs in, but is not strictly limited to, the dry season: November to April. The peak period is December to April, during which 80.1% of all visitors arrive, privileged by tropical montane weather. Most visitors to Muanenguba are people of working age (77.3%), predominantly highly educated professionals (about 80%-graduates and postgraduates) from Western Europe and expatriates working in Cameroon, motivated mainly by love of nature and culture. Visitors come from 33 countries. But France – former colonial master – is by far the principal supplier of visitors (57.3%). Arrivals are concentrated in Mwaam (the destination) and at the Ekom Nkam Falls where visitors stop-by. Demographic data also shows a male dominance of 13% contributed by sole male travellers and an apparent balance of married and single visitors (about 40% and about 39% respectively), etc. Using data on motivation, the study identified 'Holidaymakers' as 51.5% of the total, general interest tourists who enjoy visiting countries, people in Africa and famous places for various experiences, unconventionally including ‘ambiance’ (pride – about 14%), 'self-confessed and proven Ecotourists' as 46.6%, 'proven hard-core Ecotourists' about 10%, adventure travellers, family visitors, exchange visitors, business and conference trippers. Data also helped identify first-time visitors (73.8%), repeat visitors - largely resident expatriates - (21.3%, average number of visits being three) persuaded by the scenic splendours of Mwaam; day visitors (12.6%), staying over visitors (87.4% staying for 2.5 days, with prevailing patterns of popular activities during the period) and the dominance of small groups (for 91.1% of the arrivals in Mwaam – averaging four persons). Data on the trip activities revealed both dominant ecotourism/pleasure activities such as trekking and, in particular, hill walking (77.6%-figure 3); the use of binoculars and cameras for sightseeing and photography (82.7%); safaris involving birds around Mwaam, amphibians in swampy parts of Ebwo, etc, and birds and free-range animals around the villages (63.3%), as well as camping (44.0%) and ethical initiatives e.g. dealing with waste (94.5%); seeking permission to carry out some activities (43.6%); suggesting correctives (7.7%); detesting non-ethical elements (49%); and carrying out voluntary activities (15.3%). Visitors extolled many more delightful (adventure and cultural) trip activities than popular activities. Visitors use a mix of locally-owned accommodation facilities such as ‘modern traditional lodges’- small hotel establishments that contain traditional houses (ndab echum), the two ndab echum by the Female Lake or tents brought along with them. Interestingly, some ethical visitors kept ‘an open mind’ due to a dilemma as to what kind of accommodation they prefer, ready to embrace what the destination presents. Tour operators are largely absent in Muanenguba. Most respondents (76.7%) organize their trips themselves with information from trusted friends and family members. Travel freedom, viability, experience and ‘easy [and independent] decision-making’ were the most important factors given by the more forthcoming visitors. It was fascinating to note that 6.8% of all visitors who enjoy ‘friendship and cooperation with locals’, organized their trips with local accommodation establishments and villagers. This tallied with the indigene-cherished interactive visitor, nkinmut. Due to limited villager/indigenous participation, the benefits of ecotourism in Muanenguba are to a large extent limited to the frontline actors. These benefits comprise access and photography fees for councils, visitor payments for accommodation (modern traditional lodges) and wages for tourism employees – hoteliers, guides and destination workers. Only anecdotal evidence exists for wider community benefits, e.g. from the petit sale of firewood in villages and the sale of some fruits, food and snack items at road-side spots (carrefours). From the perspective of the visitors, the image of Mwaam is not undermined by premature tourism dynamics: the scenic splendours of Mwaam and life-changing experiences during fleeting interactions with some indigenes eclipse any service and logistical limitations. The future is certain for aspects of tourism in Muanenguba such as an increase in arrivals, the presence and diligence of the enlightened visitor and male dominance. Due to the premature level of development, there is ample opportunity for ecotourism in Muanenguba. A useful first step will be to create a local Ecotourism Committee comprised of village representatives to work with the Bangem Rural Council (BRC) in order to manage community-based ecotourism. Committees are an existing norm for small development projects in the villages of the region. There is a need to increase visitors’ experiences through creation of heritage trails, forest walkways, designation of well-known locations where animals can easily be sited e.g. Ebwo Peak for bird watching, as well as provision of related information. As suggested by visitors more concrete structures should be avoided. The visitors like traditional attachment to nature at the destination. Therefore more traditional houses need to be constructed at the destination and in villages en route. There is also a need to develop the nkinmut concept in Muanenguba. This is by developing services and programmes that increase interaction between visitors and hosts, such as festivals during the peak period. Behrens, J. 2005 “The Potential for Ecotourism in Cameroon-a stakeholder analysis” in Thomas J. Lichtenberg (ed.) 2005 Beiträge zum Nachhaltigen Tourismus, Schriftenreihe der Fachhochschule Eberswalde. Berlin: Mensch & Buch Verlag. Dongmo A. k.; Wandji P.; Pouclet A.; Vicat J.-P.; Cheilletz A.; Nkouathio D.G. ; Alexandrov P.; Tchoua F.M. 2001 “Volcanological Evolution of the Mount Manengouba (Cameroon line), New Petrographical, Geochemical, and Geochronological Data”, Comptes Rendus de l'Academie des Sciences Series IIA Earth and Planetary Science, 333(3). Paris: Elsevier SAS, pp155-162. Mehmetoglu M. 2007 “Nature-based Tourism: A Contrast to Everyday Life” , Journal of Ecotourism, Vol. 6 (2), pp111-126.